In Minnesota, the most commonly taken standardized college entrance exam is the ACT. In total, 61,253 students (11th and 12th graders in 2018) took the test with a Composite score average of 21.3. Minnesota student's average composite score of 21.3 (on a scale of 1 to 36) was higher than the national score of 20.8; and first among 19 states who had 89 percent of graduating class take the test. 61,253 graduates, or 99 percent, took the ACT. Minnesota students equaled or outperformed national percentages in all subjects. 30 percent of graduates met all four ACT College Readiness Benchmarks. 43 percent (26,102) graduates indicated an interest in STEM college majors and/or careers. ACT data on individual high schools can be viewed via SLEDS. Alternatively, ACT test-taker scores at individual Minnesota public high schools are available from the Minnesota Department of Education in a downloadable spreadsheet. The Minnesota Office of Higher Education only receives state-level data. 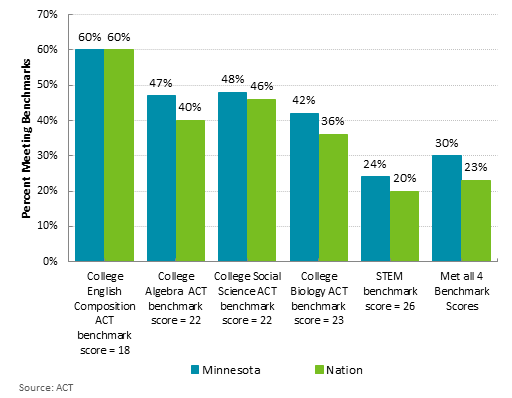 A higher percent of Minnesota test-takers are more college ready than national according to ACT data. *Percent of test-takers meeting college-ready benchmark scores. A benchmark score is the minimum needed on an ACT subject-area test to indicate a 50 percent chance of obtaining a B or higher or about a 75 percent chance of obtaining a C or higher in the corresponding credit-bearing college course. All student groups taking ACT recognized Core Curriculum* have higher ACT composite scores. *Core results correspond to students taking four or more years of English AND three or more years each of math, social studies and natural science. Reports released by ACT emphasize the need for students to take a specific sequence of courses in secondary school to be ready for college and work beyond high school. For over 20 years ACT has recommended that high school students take a certain number of courses in high school to be ready for college. ACT stresses the need for high school students to take challenging courses. Additional research found that "the level of academic achievement that students attain by 8th grade has a larger impact on their college and career readiness by the time they graduate high school than anything that happens academically in high school." The ACT test comprises four subject areas: English, reading, mathematics, science and an optional writing test. The ACT assessment helps colleges determine how well students are prepared for college. Colleges use the ACT scores for student admissions, advising, and placement. Minnesota's state universities generally require a composite score of 21 or higher for admission. The highest possible ACT score is 36. Nationally 60 percent of U.S. graduating class took the ACT test. In 2018, 123 Minnesota students achieved a perfect composite score; meaning they scored a 36 in all four subject areas. The ACT is a research-based nonprofit organization.